In tenth pAsuram – AzhwAr says “For you who is known only through vEdham and the lord of all, is it surprising that brahmA et al, who are created and bestowed knowledge by you, know you as “Iswara” (lord) and praise you?”. Subsequently, AzhwAr says “Even those who consider themselves to be the lords, since it is apt for them, knowing your lordship and taking shelter of you is not at all surprising”. iRai Adhal aRindhEththa vIRRiruththal idhu viyappE? aLandhAy – oh one who measured them (so that others cannot claim ownership)! viyappE – is it surprising? Oh one who is in the form of a blossomed radiant light, being the intrinsic essence of vEdhams which conceal (its meanings for those who are filled with rajas (passion) and thamas (ignorance)) and which are being four-fold (starting with rig vEdham etc which reveals its meaning to those who are situated in sathvam (goodness))! Oh one who time and again creates the worlds, lifts them up (by entering into the causal ocean), consumes them (during total deluge), spits them out again, and measures them (so others cannot claim ownership)! In such case, is it surprising to see such stature of being the great shelter (since he is the one who gives shelter to all) for rudhra who is engaged in enjoyment and austerity due to having chandrakalA (crescent moon) in his head and having matted hair respectively, brahmA (who has all the abilities to engage in creation), indhra (who is the lord of 3 worlds namely svarga lOka, bhuvar lOka and bhUlOka) et al and being praised by them knowing that you are the lord. 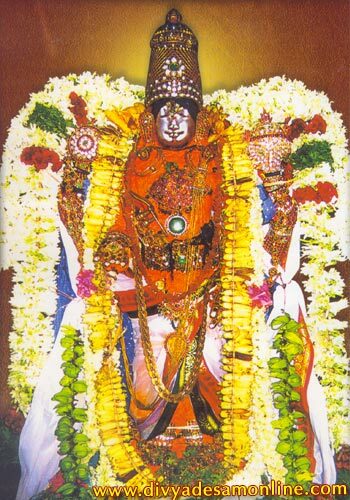 maRaiyAya – SrI rangarAja sthavam 1.19 “Adhau vEdhA: pramANam smruthirupakuruthE sEthihAsai: purANair nyAyaissArdham thvadharchAvidhimupari parikshIyathE pUrvabhAga: | UrdhvO bhAgasthvadhIhAguNavibhavaparigyApanaisthvathpadhApthau vEdhyO vEdhaiScha sarvairahamithi bhagavan! svEna cha vyAchakartha: ||” (Oh bhagavAn! vEdhams are primary pramANam (authentic source of knowledge, without need for external validation). manu smruthi is helping along with ithihAsams and purANams, pUrva and uththara mImAmsA. The karma kANda (pUrva bhAgam) reveals everything about how to worship you. The glorious uththara kANda (Urdhva bhAgam) leads to your divine feet by revealing your activities such as creation etc, the qualities that are required for such activities, the realms that are under your control etc. Also, you yourself have revealed [in bhagavath gIthA etc] that you are only known through vEdham which is divided in to pUrva and uththara kANdam). Here vEdham is highlighted by two words – maRai (one that conceals) and vEdham (one that reveals) – this is because, for those who are outside vEdham without any faith in it, it hides itself and for those who are faithful, it reveals its meanings. pUrvA bhAgam (karma kANdam) explains the process of worship and uththara bhAgam (uththara kANdam) explains the nature of the object of worship (bhagavAn). The lustre acquired due to being revealed by all of vEdham as said in bhagavath gIthA 15.15 “vEdhaiScha sarvair ahamEva vEdhya:“. Oh one who is shining in the vEdhams as the lord of everyone and has unsurpassed sweetness. muRaiyAl … – vEdhams explain that he is the protector of all. muRaiyAl – two meanings – 1) relationship – due to him being the lord, 2) repeatedly in every cycle of creation. During deluge, when the AthmA was devoid of karaNa (body) and kaLEbara (senses) and without any means to enjoyment in this world or for liberation, emperumAn creates them [i.e., gives the body, senses, ability to act etc], assuming the form of mahAvarAham (great wild-boar/pig) and rescued the created world that was consumed by the causal ocean, protecting the world by keeping it safely in his stomach when there is a deluge again, then spitting it out again, when people like mahAbali steals (claims) bhagavAn‘s wealth like an eagle plucking its prey, emperumAn rescues the world from him by measuring it up to the boundary. Oh one who is protecting in so many ways like this! [Here a question arises, is this not the karma which leads an AthmA into a particular birth? why are these actions highlighted as favours to the AthmA?] The karma of the chEthana is the viSEsha kAraNam (special cause) that leads to the variegated bodies one may acquire. yaugapadhyam anugraha kAryam [But, the whole universe(s) is created at once out of bhagavAn‘s mercy on seeing the plight of jIvAthmAs without any body/senses] – bhagavAn is thus the sAmAnya kAraNam (common cause) for whole of creation. piRai ERu sadaiyAnum … – rudhra who is having matted hair in the form of doing penance, yet, having the [cool] crescent moon on his head and being the prime enjoyer; brahmA who is the father of such rudhra; indhra who is [having greatness to be] counted along with those two; by them glorifying you and you manifesting your distinct nature due to that, is there anything great for you? Like a person making a doll, decorating it to look great, keeping his feet on its head and pridefully claiming “it worshipped me”, like it is said in thiruvAimozhi 7.5.4 “nanmaip punal paNNi nAnmuganaip paNNi” (creating the good causal ocean and creating the brahmA), if brahmA who was created by you and these other dhEvathAs who are created by brahmA praise you and if you become proud about that, is there any greatness in it? would you not be a laughing-stock by doing this? This entry was posted in thiruvAimozhi, thiruvAimozhi 3rd centum on July 16, 2016 by Sarathy Thothathri.